There are many reasons cannabis should be legalized. The most obvious is social justice. Other equally logical reasons include its therapeutic value: cannabis has been shown to help manage conditions like anxiety pain, and childhood epilepsy with startlingly few side effects. If things like logic, low addiction rates, social justice, and better healthcare weren’t enough to convince you cannabis should be legal, here’s a superficial reason —your skin could become flawless. We covered this a few weeks ago, but there is a host of research showcasing the potential for cannabinoids to treat inflammation, bacteria, and spark cell regeneration. Many products on shelves currently use hemp seed oil because it hydrates, easily penetrates the skin locking in hydration, and doesn't block your pores. With CBD becoming a mainstream darling, an increasing number of brands are using full spectrum hemp and hemp seed oil in products. Yes, those two terms mean different things, keep reading to find out why. To help you navigate the market, we’ve been testing products and asking around to curate the most effective brands. This week we're covering skin care products that contain CBD or use hemp seed oil. Next week we'll share our favorites in body care, hair care, and finally, a CBD routine we think is nice. 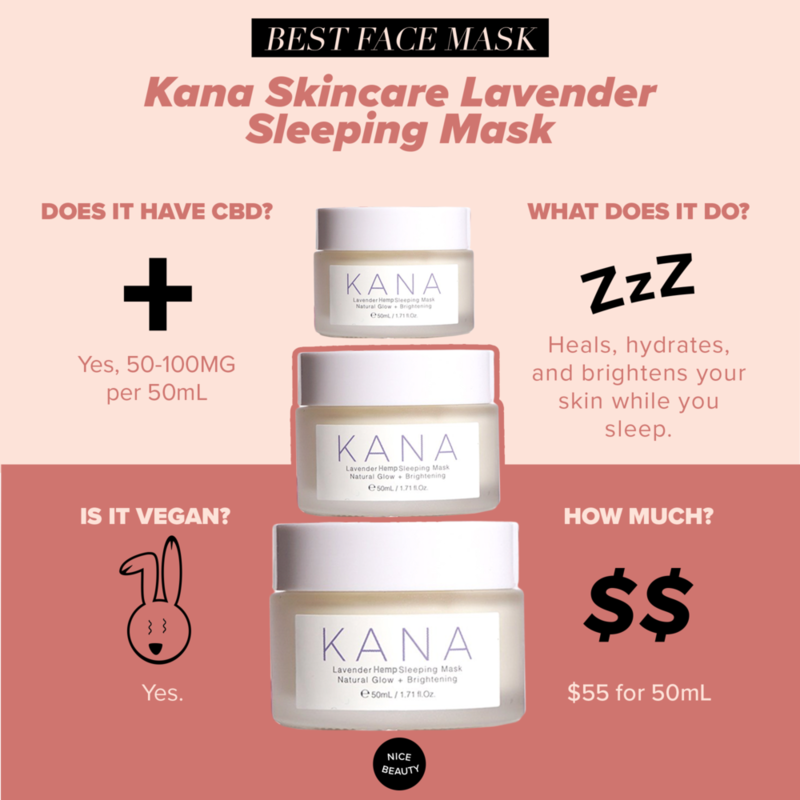 This is not an exaggeration: Kana skincare has the best overnight mask, ever. It’s a game changer. On really dry skin days and travel days, slather this on your face; it’s small enough to get past the TSA and is more discreet than slapping on a sheet mask. Each mask contains 50mg to 100mg of CBD and the custom formulation embodies the tenants of Korean skincare, packing over 28 active botanicals. It’s important to note that while dosing is important, it’s more important to have your CBD extracted responsibly: Kana uses CO2 extraction methods making it safe for your face while keeping the whole plant’s botanicals intact. Ildi Pekar is something of a skin whisperer. Hailing from Budapest, the “spa capital of the world”, we’ve already raved about her facials but this serum also makes the list. Using a host of ingredients that are good food for your face including Aloe, Vitamin C, vegetable derived probiotics, and, of course CO2 extracted CBD this serum helps rebuild cells, reduce inflammation, and plump your epidermis. Face oils are hit or miss. Sometimes they don’t soak into your skin, leaving it greasy and impossible to get any makeup to set, other times they can leave your skin feeling dry. With floral and woody notes, this light oil is great for sensitive skin and/or anyone that wants an instant glow without the grease. Active ingredients include Eco-certified Hemp Extract + Ruh Khus + Rhododendron, Somalian Frankincense, Co2 + Wild French Lavender, and Black Currant Seed Oil. Weightless and fast-absorbing, this recently launched fan favorite is a rose-scented and multitasking beauty oil. Infused with CBD, it can be applied to any part of your body (yes, that includes your hair) to instantly hydrate and give you a glow-up with 16 antioxidant-rich and anti-inflammatory powerhouses like Rosehip, Jojoba, Argan, Moringa and Camellia, coupled with the star ingredient, phytocannabinoid-rich hemp extract (CBD). While we’re big fans of CBD for your face, hemp seed oil is equally as good for your pores. NOK Apothecary sells a great virgin cold-pressed organic hemp seed face oil for $9. Remember, cannabis sativa seed oil and hemp seed oil are not the same thing, both don’t have CBD but they are both great to moisturize and revive your face. This CBD balm combines the restorative powers of Manuka honey with CBD’s anti-inflammatory properties. A mix of healing oils hemp seed, Rose, Grapeseed and charged with Vitamin E, this balm creates a protective barrier and melts into your skin, smoothing fine lines while lightening dark circles. Make sure to tune in next week for our second installment of the beauty awards.